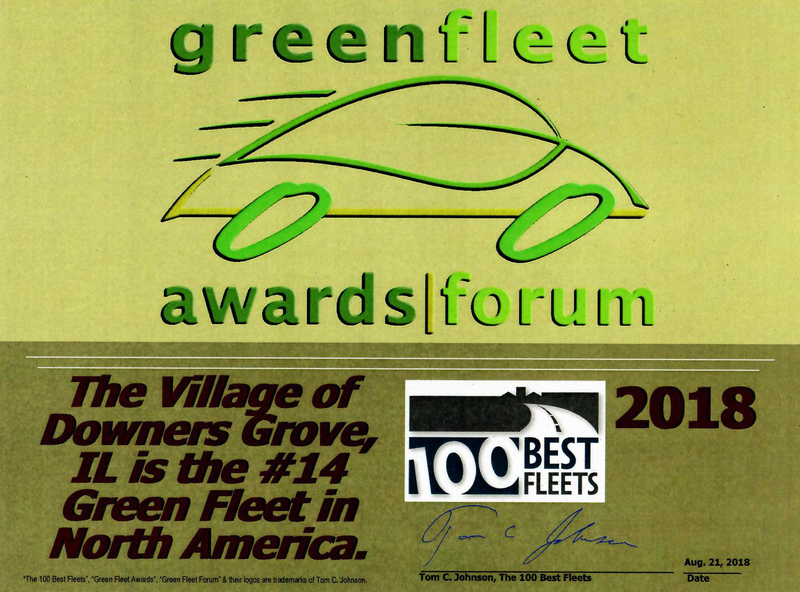 The Village of Downers Grove has been selected the #14 Greenest Fleet in North America. Each year the Government Green Fleet Award ranks the top 50 fleets for their dedicated use of alternative fuel and hybrid vehicles. The Village has ranked in the top 50 for five consecutive years. Of the Village's fleet, 83% utilize some form of alternative fuel. These alternatives include Biodiesel (B-20), E-85 (Ethanol), Compressed Natural Gas (CNG), propane, solar power, and hybrid combinations. The Village uses CNG fuel to power a wide range of vehicles including compact sedans, pick-up trucks, cargo vans, police patrol vehicles and five-ton trucks. The Village's five-ton trucks were the first in the midwest to be powered by CNG. The implementation of green initiatives like the use of cleaner, more efficient alternative fuels achieves the Village's Strategic Plan goal of being a Steward of Financial & Environmental Sustainability. Using alternative fuels reduces the environmental impact of fleet operations and is more cost effective than traditional petroleum based products. These awards are supported by the Clean Cities Coalition, which is operated by the U.S. Department of Energy. Being selected as an award winning Government Green Fleet is a great accomplishment for the Village.